2.5 cubic yards of triple mix soil for the veggie garden. :) Thrilling, I know. After weeks of looking at different types of soils, I went with a triple mix from Van Beek’s. It’s made from composted manure, black loam, and sandy topsoil. I couldn’t find ‘certified’ organic anywhere, but the owner said it is organic and assured me that they do not add any chemicals or fertilizers to it. That will have to do! Take the Length (ft) of the area to be covered x Width (ft) x Depth (inches) divided by 12, then again divided by 27 and you have your cubic measurement! For two 4 foot by 8 foot beds, I calculated our soil need to be about 2.37 cubic yards, so we ordered 2.5. The rain sure has made our lawn green though! I’m going to the nursery tonight to check out the new organic plants that just came in and figure out what I need to buy. So far, I have sketched out a rough plan for both of the beds using this Companion Planting info to guide me. I’m trying to plant veggies with their companion plants, figure out specific spacing/planting requirements, and also how many of each plant I will need. Meet: Chocolate Chip Cookie Dough Cereal– a new breakfast and snack infatuation. 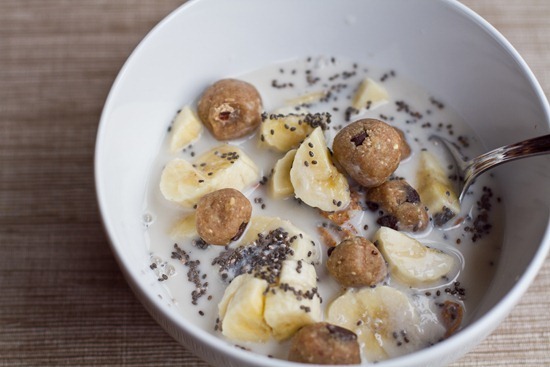 In the cookie bowl: Nature’s Path Spelt cereal, chopped banana, 1 tsp chia seeds, 8-10 mini Chocolate chip cookie dough balls, and non-dairy milk. It tastes like you are eating a bowl of chocolate chip cookie dough for breakfast! Another breakfast I’ve been rocking this week…The Mango Banana Green Monster. I recently discovered that President’s Choice sells frozen mango chunks. I haven’t had the best experience with some frozen fruit mixes, but this frozen mango is super fresh and sweet. You can nibble on it straight from the bag. :) It is great to keep in the freezer for quick and easy smoothies. 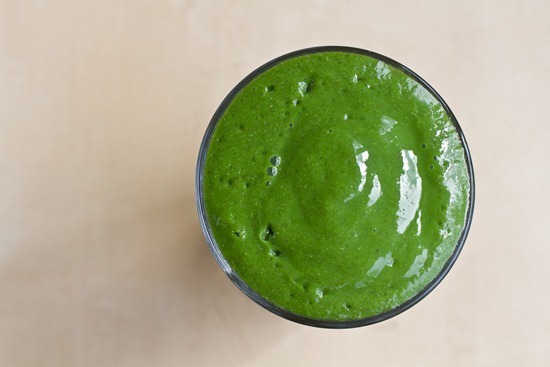 This week’s favourite mix: 1 cup frozen kale, 1 ripe banana, 1/2-2/3 cup frozen mango chunks, 1.25 cup almond milk, 1/2 scoop wheatgrass powder, 1 tbsp chia seeds. YUM YUM YUM!!! I love your smoothie recipe!!! Where do you get the Wheat grass powder? It does NOT taste good by any means, but you can mask the taste in a smoothie. Oooh yum everything looks delicious this morning! Well, except the soil I suppose, but that is exciting too! I was at Costco on the weekend and found that they have big Kirkland bags of frozen fruit, including mangos, for a pretty reasonable price. I might have to get a couple of bags next time. I can’t believe how all-out you guys are going with these flower beds – they look great!! I hope you have a lovely day Ange! Can’t wait to see the veggie garden in a couple months at full effect!! Where do you buy the frozen kale? Chocolate chip cookie dough = breakfast of champions! I want to have that for breakfast — ok any meal of the day will do. I love anything with Chocolate Chip Cookie Dough–in fact, I’m eating some of the raw stuff (it comes in a cute container) on a piece of banana right now! ummm why wasn’t this my breakfast?! Ohmigawd – cookie dough for breakfast?! That looks sooooo good! I’m going to make some chocolate cookie balls today. The garden is looking great! Seriously. You are SO inspiring. Thank you for doing what you do! You ROCK! Will you be posting your garden plan? I love to see how other people plan out their gardens! Great work on the veggie garden…I’m trying to figure out the logistics of building my own on my condo balcony(first time)…how deep do you think I should make to planter to get anything other then herbs growing?? Cookie dough for breakfast?! You’re my kind of gal! Your green monster looks fabulous too ~ mango has been everywhere in the blog world lately! you’re killing me! cookie dough for breakfast….YOU CRAZY! Oh that looks so good. I’m further south than you so we planted in our raised bed last weekend. Heirloom tomatoes and peppers, lettuce, chard, spinach and lots of herbs. We’ll see how it all turns out! There are so many awesome things going on in this post! The gardening thing is super exciting, that cookie dough cereal looks to die for as does the mango green monster! And the quote is SO fabulous, I love it! do you buy your kale already frozen or do you do it yourself? I normally put spinach in mine but I want to try kale next time! Your garden plots look great too!! you are so lucky to have a big yard. for now my veggies growing on my deck will have to do. This was my first time trying a bag of frozen kale. Our grocery store never has fresh or organic kale (and when they do it is often wilted) so I picked up a bag of frozen kale in the natural food section. 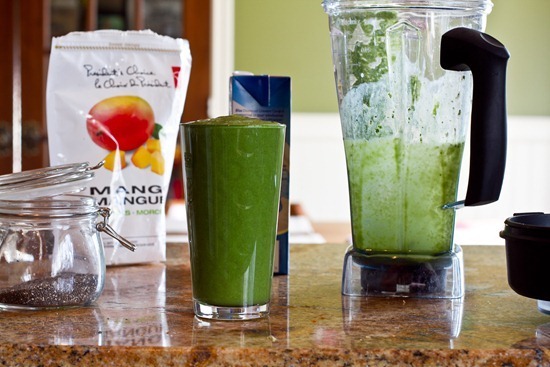 It is GREAT for smoothies…not bitter like fresh kale in a GM. Both breakfasts look delicious! That smoothie is so GREEN! Love it! Thanks for posting the list of companion plants, I honestly didn’t know that existed. Who knew basil kills rosemary?! I am buying the plants for my raised bed this weekend, I may be re-thinking that list! Thanks again! I don’t know what looks better – your garden or that smoothie! I wonder if I could make that smoothie with dried mango. I bought some dried mango, and I have no clue what to do with it! I wish I had a green thumb, I’m lucky I can keep me and my daughter alive, lol… oh, and bamboo plants, anything else and I can’t say I didn’t warn you. And mangoes in green monsters absolutely rock! Oh yuum!! I must have missed the post about the cookie dough balls – so trying this! I’ve been loving the frozen mango too! How amazing are they?? They just taste like summer to me. 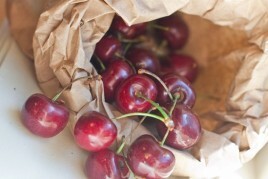 I’ve just been having them in regular or berry smoothies; I’ll have to try them in green monsters too…yum! Fresh dirt is exciting! I need to work on my garden desperately this weekend. It’ll be raining of course. Whooo, cookie dough for breakfast! Don’t even tell me that. Now I have an excuses to eat cookie dough all day! Looks like your garden beds are ready to go!!!! I am on a serious mango kick right now…I can’t get enough of them!! We are having a major kale shortage here!! I usually go through 2-3 bunches a week, but have only had it about once in the past two weeks. So sad! The garden beds look great + I am completely jealous!! :) We just don’t have time to add that to our list of things right now!! Maybe, mid-summer I can plant a mini garden though or at least some herbs. One other thing you can add to your birthday list, is a rain water harvesting bucket!! hehehe http://www.rainbarrelsource.com/rain-barrels/12440+12448.cfm?source=googleaw&kwid=rain%20water%20barrels&tid=modbroad I definitely want a compost bin started pronto! Happy Friday!! That GM combination is one of my favorites! 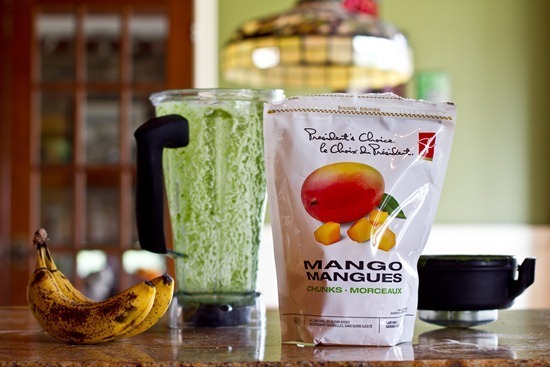 Mango adds SO much to a smoothie. I’ve actually been adding coconut to my banana-mango GM and it is soooo deliciously creamy. Love that you just add frozen fruit bits to your smoothies…how easy is it to pull something out of the freezer that is peeled, cubed and ready? Love it, and will try this whole chia seeds in smoothie thing…I’m skeptical but I’ll try! I just cant get over Chia pets! dont worry they are tasteless! And I cant detect them in a smoothie at all. The Green Monster looks so beautifully GREEN!! haha. And the chocolate chip cookie dough breakfast cereal sounds like the BEST CEREAL EVER! Fabulous idea! The chocolate chip cookie dough cereal sounds so yummy! I’m going to have to try that out soon! My parents have two planter boxes just like yours in their backyard and they absolutely love them. Plants grow very well in them. My mom plants 8 tomoato plants every year in each and they grow to be huge with a ton of fruit on them. Yum! This looks amazing!!! Cookie dough is a serious weakness for me. I will have to try out this recipe. The smoothie looks delish too! Thanks for sharing. Dont get your hopes up too much…I could kill every plant by the end of the week! 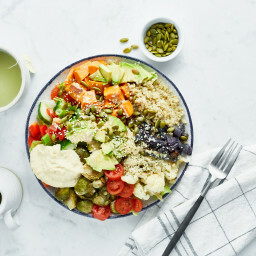 Not sure if you have ever tried VEGA – whole food optimizer, but its an amazing, completely vegan and gluten free, breakfast. 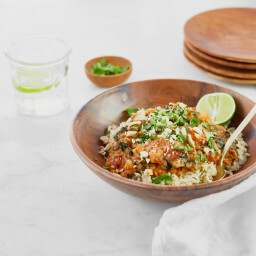 Protein in the mix is derived from hemp, lentils, and brown rice only. So many good things in there also that help to balance my hormones, keep my full for a couple hours and give me energy all day. I havn’t felt the afternoon need for caffine in weeks since I started having a smoothy every morning. I started adding kale to it recently too to make my own version of the green monster! I highly recommend it for adding to your mix if you want to try something new! 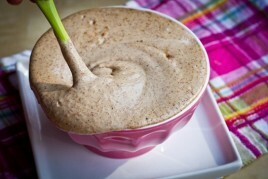 I use the chocolate mix and add banana, almond milk, and peanut butter for quite a delish combo. I have heard the berry mix is better though and might be more your style! I have not tried the whole food optimizer, but I do use the vega choc-o-lot made with pea protein (love it!) Do you know how the optimizer differs from their other powders? From what I understand whole food optimizer is pretty similar to the cho-o-lot protein, just a little more of everything plus some addition benefits because its more like a meal replacement vs. protein replacement. Here a link to the website if you want to check it out for when you need a new batch! Whew what a project! That might be the greenest green monster I have ever seen! Banana mango is my staple Green Monster! Sometimes I put a little chocolate Amazing Grass powder in just for a kick. LOVE how green and vibrant your monster is! Haha I just saw Allie from LiveLaughEat eating cookie dough for breakfast. Now this is a trend I can jump on! Your breakfast looks so yummy! your garden is making me want a yard even more than I did before! can’t wait to see how all your planting turns out! Angela, you should go up the street to the mushroom farm and get some of their spent mushroom compost that is out front… it’s a great soil conditioner/fertilizer with no chemicals… and the best part, it’s free! Your best bet would be to take some empty bins or garbage cans and fill them up… if you had access to a pick-up truck I would say just fill up the bed! Compost bin as a birthday wish?! How quirky and lovely:) I like the idea! Getting those 2 garden beds ready must really have been a work out. Compost bin: must have. We use ours all the time for all the fruit & veg and tea bags that we go through – except in the winter when it freezes. Then we use the city’s green bin collection service. Thanks for the heads up on the PC frozen mango. I’ll have to give it a try. I’ve just discovered putting kale in smoothies and i love it! Thursday my blog totally rocked the PC frozen mango as well, lol! I love that you had cookie dough for breakfast (I had a blueberry cupcake) but it’s Friday so enjoy!!! Hiya Angela! That last quote is really beautiful. Think it’s gonna stick with me for a while. Might be my summer mantra! I’m excited for your garden! I want to garden too but maybe one day when I have a home of my own and not some teeny tiny apartment =P It looks good so far and I’m looking forward to watching it progress. Oh yea, and what kind of blender do you own? Also food processor. I’m in the hunt to replace mine (which lasted less than a year!!! sucker). Also, I’ve always was interested in a food processor but can’t seem to justify the purchase – I mean if I have a blender doesn’t it do nearly the same thing? i’m obsessed with frozen mango slices!i could eat the whole bag in one sitting …and I have before. whoops! 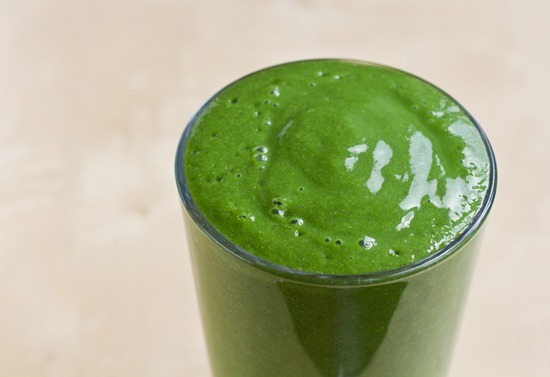 Absolutely loooove all your amazing recipes:) Can you recommend a good Wheatgrass powder? OMG that cookie dough cereal sounds amazing! Like desert for breakfast! And I’m sure the combo crunchy cereal and chewy dough balls is amazing! That pile of dirt looks like the long lost twin of what’s in my driveway! We’ve already spread it all over our lawn (for filling in grass) and in my raised garden bed and we still have a huge tower of soil and a small pile of compost. My husband is apparently an over-orderer when it comes to dirt. Or his eyes are too big for his wheelbarrow. 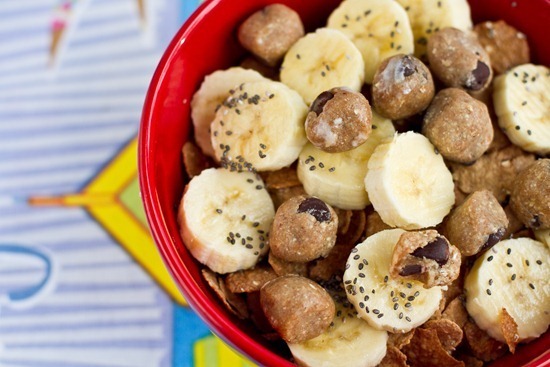 That chocolate chip cookie dough cereal looks divine. I don’t even eat cereal (it never keeps me full) but I would eat that just for the cookie dough chunks. Yum. haha we have a ton of dirt leftover too! Congrats on starting your garden Angela!! And don’t worry… composting is cool these days! And, I am totally making this Chocolate Chip Cookie Dough Cereal! :) Looks so tempting! 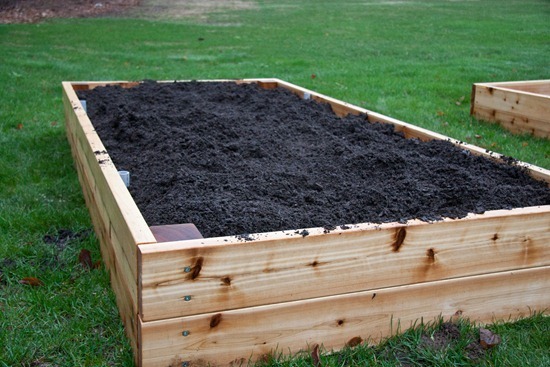 I love veggie garden boxies; i plan on doing carrots, peas, tomatoes, and strawberries. that breakfast and smoothie look so SUMMERY! yum! I love to add frozen mango to green monsters! You just made me crave one ;). Im so jealous of your gardens cant wait to see them all planted! I’m excited to see what you grow in your garden. And I too have just discovered the President’s Choice frozen mango. It’s delicious. As is their combination that has peach/pineapple/grapes/melon and strawberries. (that combo is my “smoothie go to” mix) President’s Choice is the best!!! I see you use wheatgrass powder, but what do you think of the liquid? It’s an acquired taste I know (!) but it’s kinda nice! Do you use it anytime? Also, check me out using you as inspiration! I know how much enjoyment you get from food and am trying to channel this in order to shed past issues really. Take a sneaky peek and let me know if I’m Oh She Glows approved!!!!! I got a composter for our anniversary one year. Some might think that’s insane, but I was stoked!! The cookie dough balls. I am a huge fan of cookie dough and make it in all forms and flavors, bites, balls, choc dipped, with white chunks, dark chunks, you name it, I’m there. Your b-fast cereal would be a major hit for me! That green monster looks amazing! I had my first green monster yesterday (just spinach, frozen banana, almond milk, and ground flax) and I’m in love! those breakfasts are so exciting! I can’t wait to hear more about the garden. I will be planting one next year in my garden at my new apartment so I’ll need tips! I had a mango avocado smoothie today and it wasn’t half bad. Still needs a bit of work, but there’s potential! Mango is sooo delicious! I’m planting a garden this weekend too! Thanks for the link to the companion plant list – it really helped! My backyard looked like yours last week! This my first year planting a garden so I’m crossing my fingers. I now have a few months of successful wheatgrass growing under my belt, so I am hopeful that at a minimum I get a bowl of strawberries and one stirfry out of the effort. Happy planting! Wow with that cookie dough cereal/snack. Amazes me how much fun we can all have with whole food ingredients. I much prefer this idea to real cookie dough. Go you with the garden. Love the thought of the workout being lifting that heavy soil. Why have I never had a green smoothie?? And I’m pretty jealous of your new soil! Brilliant! I WILL be making these soon :D.
1: Love your beginning garden! I miss mine, I’m off on a work project and away for a few months. 2: I am living in a hotel while on this work project and now I am thinking I need to buy a blender because the green monsters are looking good! I am attempting to go veg for the whole two months and some day just aren’t so good. A green monster would cheer me up for sure! And that cereal—mmm! Sounds like my week! Our garden beds are in and the composted has been built and is starting to be used, now I just need soil so that my seedlings can leave the greenhouse and really flourish! Just out of curiosity though, why the insistence on growing only organic produce while shopping for PC frozen mango? I’m always curious about people’s local bs. Organic opinions! I recently tried frozen mango as well! I think mango and strawberries are the best freezer fruits. I haven’t had the greatest luck with frozen fruit either. The President’s Choice frozen raspberries and frozen mixed berries really don’t defrost well! That’s exciting to see the garden coming along! 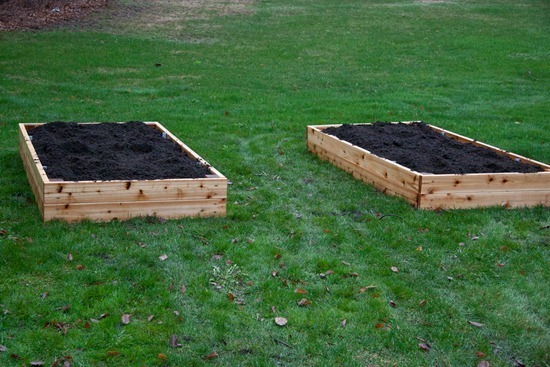 Super exciting about the raised plant beds, I need to get started on my own (container) garden soon! Just wondering if you were able to find a triple mix with plant manure and if not, were you at all concerned with using animal manure in your food garden? The frozen mango reminds me that I found frozen cherries at Costco recently and I wanted to pass that along since they are so hard to find in Canada. Mango Green Monsters are my absolute favorite! I usually use a frozen banana and then an almost too ripe mango. It comes out perfectly sweet, smooth, and neon which I love! omg i LOVE to have cereal for breakfast and this is just perfect!! i’d probably eat it for snack too haha :) thank you! That sounds like the best cereal bowl ever! Did it fill you up? 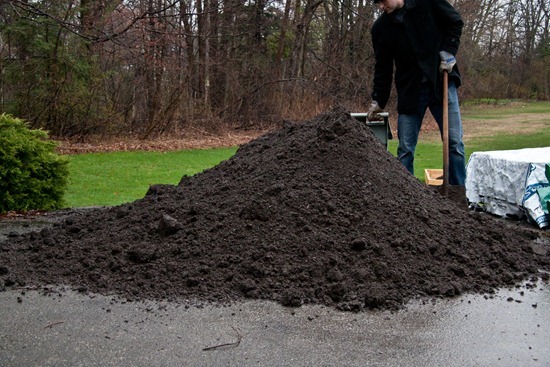 Compost manure is the best soil for planting tomatoes in! They friggin’ love it. I’m so excited to see how your garden pans out. I’ve been loving my garden this year because last year I was super pregnant throughout the most work intensive garden season and I couldn’t do very much and even hired the neighbor boy to weed for me but this year has gotten great start! Best breakfast! I was wondering, as the Green Monster Queen, whether you’d have recommendations for banana-less and mango-less smoothies? Bananas currently cost $2.50-$3 EACH in Australia right now, and mangoes aren’t in season (and we don’t have frozen mangos, at least not that I’ve ever seen!). I’d really love some ideas for a good smoothie without those two fruits, as my efforts have been lacklustre lately! That breakfast has my drooling! WAAAAY better than Cookie Crisp cereal…then again, the cookie dough was always better than the cookies! Frozen mango is awesome. I love how it has the “banana creamer” effect too. Good Luck on your garden! That sounds so so yummy!! I love the idea of using those “balls” in the cereal, I wonder how it would taste with a broken up cookie dough larabar?! What a great idea! Chocolate chips at breakfast are always a hit :) Thanks for the quote btw, very inspiring! 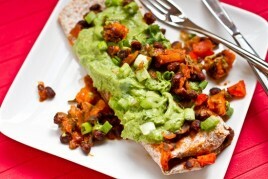 my husband saw the title of this blog today and said, “Babe, make that for breakfast!” It does sound delicious…. chocolate chip cookie dough breakfast cereal! THANKS- can’t wait to try it. Hi Angela! I’ve been lurking around here for a while and was finally encouraged to comment and even start my own blog! But that’s besides the point! I’m so jealous of the beds you’ve made! If I had the room, I would do exactly the same. Also, that breakfast sounds amazing and will be the next recipe of yours that I try. I finally tried VOO and I LOVED it! It was amazing with banana and strawberry soft serve. YUM! The breakfast cereal looks like it came from heaven. Can’t wait to try it! J’adore les mangues! Mary, Mary, how does your garden grow? :) It looks great thus far! That cereal looks heavenly!!! I love, love, love cookie dough!!! Im a 23 year old girl, vegetarianer from I was 12, and vegan since I turned 18, and I have struggled with eating since i was 12. Although I wont say I have a ED at the moment (I used to binge, starve myselfe, overtrain when I was younger), I still have a really messed-up relationship with food. I want to show myself that my body is trustworthy, but I keep making “plans” (only raw food, only macrobiotic ++), instead of listning to my body. I have decided that I WANT to start really listening to my body- I know it knows whats best, and I have started to see my psychologist again. I never knew it was going to be SO hard! I have only worked with it for the past few weeks, and some mornings I just cant get up because it scares me so much not to have a food plan. Obviously Im still vegan (Im that for so many other reason too, not just healt), but not being “all raw” or what ever, makes me so scared to make mistakes. Anyway, I have a long long way to go, but I have found reading this kind of health blogs so helpful. I have a few favorites that really helps me see that it is possible to make my realationship with food good and healthy again. And you a one of the girls I admire the most! You are such an inspiration to me, and I just want to thank you so much! Thank you thank you thank you! Really! Thank you so much! I wish you all the best with your journey. I have been thinking about these chocolate chip cookie balls and banana soft serve since this post. Today I bought a bunch of extra bananas that I will hide from my husband so he doesn’t eat them just for the banana soft serve! And I’ll make the chocolate chip cookie balls to go on them. Can’t wait! THAT LOOKS AMAZING!! I’m going to have to try this ASAP! Also, how much cereal did you use? mm maybe 1 cup or a bit more? A bowl of cookie dough for breakfast?? I’m in!! I absolutely loved the cereal bowl idea! I must admit– not only does it feel like a treat for breakfast (cookie dough balls?! ), it is very satisfying, too! I made cherry coconut amaretto cookie dough balls to top my cereal with. Yum, yum, yum! I’m also a fan of this particular green monster as well. It’s perfectly refreshing, and right on par with the spring-like weather we’re having in the SF Bay Area. I tried it this morning, and I’m hooked. Thanks kristi! 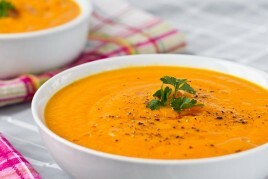 Im so happy that you are enjoying the recipes.